After its opening in September 1967, the faux-Colonial building at 425 Lombard Street looked like an iceberg broken free from Independence Hall four blocks up Fifth Street. The inside, pristine as it was, revealed surfaces and spaces worthy of the Old School-New School dispute. To start with, money for construction had been tight. Department Manager Bill Miller once told me that United Presbyterian Church in the U.S.A. (UPCUSA) Stated Clerk Eugene Carson Blake suggested eliminating the basement from the design as unnecessary. Fortunately for us, as planning firmed up, Bill Thompson took over as Stated Clerk. Thompson was a great admirer of PHS who brought each new GA moderator to Philadelphia to spend a day at the archives learning about PHS’s work. Between Thompson and the General Council Executive Secretary Theophilus Taylor, who was “very pushy” according to Miller, the basement was kept, meaning the Society was able to include a two-story vault for its most valuable records. Upper vault and spin lock, September 2017. Another basement gem from the time was the staff break room. As inviting as Society Hill is now, in 1960 it was a rough neighborhood. 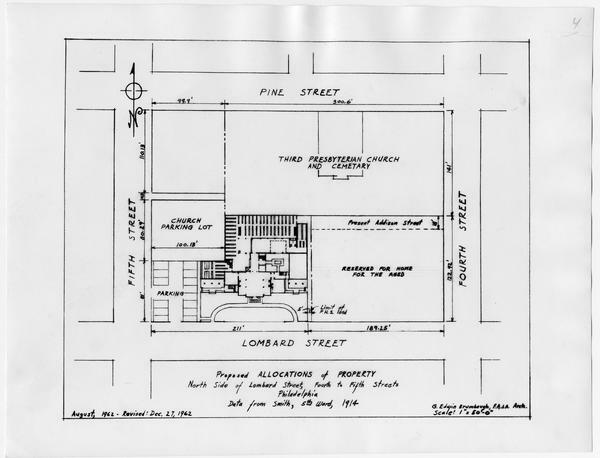 When Miller recruited Gerald Gillette as Guy Klett’s librarian replacement, he showed him the plans for the new building. Gillette took one look and said, “This is a horrible place to build a historical society. It’s a very bad side of town.” Miller and architect G. Edwin Brumbaugh remediated that issue by including a basement staff room so that employees wouldn’t have to venture outside for lunch. Nora Robinson, assistant cataloger, ensured the move from the Witherspoon Building would go smoothly—by very, very carefully measuring the volume of records and detailing the shelves they would go to. She told me that others were not quite so perfectionist. On the day of the ceremony opening the new building, the handle to the front door fell off on the inside when Gerald Gillette pulled on it. A building of its own gave the Society the opportunity to display its treasures, among them two hundred valuable portraits of early Presbyterian luminaries. First, architect Brumbaugh had to be reined in. The Society was pleased at his attention to detail, researching historic paints, creating reproduction door hardware—but when Brumbaugh pointed out that homeowners in the eighteenth century did not “hang” portraits, but simply nailed them to the wall, Miller and Gillette put their feet down and insisted on traditional hooks and wires. The Society has always used special artifacts and art objects to entice folks inside. Among the very first of these were dueling pistols of Colonel Gardiner, relics of the English Civil War that were taken from his person after his death at the Battle of Prestonpans. In May 1861, as our own Civil War erupted onto the national scene, the Old School General Assembly met in Philadelphia. Samuel John Baird, secretary of the then nine-year-old PHS, showed what the Society had done up to that point to preserve the history of the church and exhibited Colonel Gardiner’s pistols on the table in front of the speaker’s platform. While the Assembly voted to commend the Society to the churches (despite the animosities and turmoil of the political situation), members of the Assembly freely handled the pistols and, according to The Presbyter newspaper, “comments of their great size, their fashion, etc., were indulged in.” Bill Miller’s successor, Executive Director Fred Heuser, once told me that visitors were prohibited from handling the pistols after Gillette saw a visitor longingly staring at their lobby display. When the gentleman went out to lunch, Gillette quietly returned the pistols to a locked storage shelf in the vault. 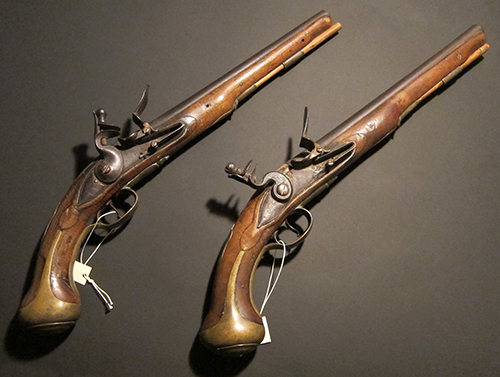 Colonel Gardiner's dueling pistols, September 2017. The building at 425 Lombard Street has many stories to tell. Some will puzzle future generations. In 1984 the Board of the Society met in the Reading Room for a preview of Jim Smylie’s compendium American Presbyterians: A Pictorial History, published as the Spring/Summer 1985 issue of The Journal of Presbyterian History. As Jim displayed copies of photos around the room, several disappeared into the crack between the built-in bookcase and wall, to be hidden away like items in a time capsule for decades to come. In 1989, when the PC(USA) General Assembly held its 200-year anniversary meeting in Philadelphia, a planned time capsule was placed in the front yard, there to remain undisturbed until last year, when alterations to Heritage Walk forced the capsule’s relocation. Another generation hence, in June 2039, the capsule’s seal will be broken for the first time and a new group of 425 caretakers, volunteers, and researchers will look inside. Want to read more? Visit PHS to read nineteenth-century Presbyterian journals such as The Presbyter and the PHS website to listen to twentieth-century audiotapes of the staff members and church officials mentioned above. And check out Jim Smylie’s pictorial history, American Presbyterians. Virginia Rainey is a PHS Advisory Council member, former PHS Board director, and former member of the Committee on the Office of the General Assembly. A ruling elder in the State College (Pennsylvania) Presbyterian Church and stated clerk of the Presbytery of Huntingdon, Ginny is also the author of Stewards of Our Heritage: A History of the Presbyterian Historical Society.